I have built a website with video tutorials and online resources for all my workshops. You are welcome to use them with your students. Please let me know if you have any questions or concerns. I have been pushing for an After Effects ACA exam for years and it is finally coming out along with my newest book that will help prepare you for the exam. This one is super fun and features my some special guest from the Dockery household. 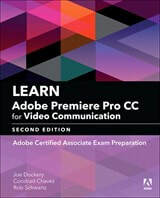 I am excited to announce the revision to our Learn series book on Premiere Pro. 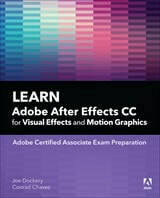 I am hoping to start work on an After Effects book for the new exam coming out this year! Pearson Higher Ed Order Dept. You may also place your orders 24/7 at the following URL: http://oasis.pearson.com to enjoy the same convenience as our website but still place orders on your business account. Please register to receive an User ID and Password. Our goal is to give young women filmmakers in the Puget Sound area the opportunity to create films that showcase their perspective, juried by experienced women filmmakers and screened at high profile, high quality events that help to connect our students with women in the media industry. I will be re-building both the Premiere Pro and After Effects courses this summer to bring them inline with the 2018 exams coming out next year. My students have been doing some amazing work with our new DJI Inspire 1 and Phantom 3. We have been working hard to capture the construction process for our new elementary school and recently recorded flyovers of our local golf course. This new technology is a transformative change with huge possibilities. Quadcopter Video Site: Check out my site dedicated to aerial/action videography. Join our group of educators working on developing curriculum for our aerial programs. Here is a link to my classroom website. Intro to Digital Media: This is a one semester class covering video/animation/graphic & web design. Photography 1: This is a one semester introduction to Photography at our Freshman campus. Google Drive Lessons: If you are like me, Google Drive is a key part of your instructional tool set. Here are some of the lessons I have developed for my students and staff.